Until now, if you’ve been shopping for a Cadillac SUV, your choices have been the Escalade and the XT5. To these two, Cadillac is now adding a third option: the XT4. As the name implies, this is a size down from the XT5, and much smaller than the plus-sized Escalade. In other words, it’s the Cadillac SUV sized for the city. From end-to-end the Cadillac XT4 measures 4.6m. It stands 1.6m tall and it’s 1.88m wide. That makes it 200mm shorter and 50mm lower than the XT5. As a result, it’s easier to park and easier to climb in and out of. Sit inside though and you’re unlikely to notice much difference from the XT4’s larger sibling. Front seat shoulder and headroom are ample. Move to the back and you’ll find class-leading legroom. Cargo space is also impressive. Leave the back seats up and you get 637 liters — enough for golf clubs or a week’s worth of groceries. Fold them flat and you open up 1,385 liters. That’s enough for, well you’ll think of something. This is an aspirational vehicle, and Cadillac has made sure it’s suitably eye-catching. The first things you’ll notice are the spectacular daylight running lights. These vertical “light blades” form thin white lines running down the forward corners. From the top, they branch out into the fenders and over the LED headlights to create a “T” shape. An imposing grille is topped by a hood with a distinct power bulge providing space for the engine beneath. Along the sides, the bodywork is smooth and fuss-free but get to the back and there’s another surprise. As with those daylight running lights, the tail lights are also mostly vertical, making an “L” as they turn 90 degrees and run into the liftgate. And one last styling observation: the liftgate glass leans forward steeply, giving this SUV an athletic, sporting appearance. The 2.0 liter turbo in the XT4 delivers 177kW and 350Nm of torque. What’s particularly impressive is that the torque is pretty much constant across the rev range. (Translation: press the gas pedal and the XT4 surges forward.) Merging onto a crowded highway holds no terrors when you’re driving this SUV. 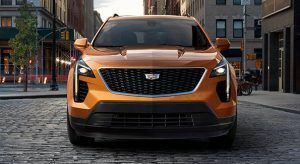 Aiding that performance is a slick, nine-speed transmission with something Cadillac calls, “Electronic Precision Shift.” To put that in English, this car shifts so smoothly and quickly it’s as if it reads your mind. While on the subject of power, we should mention fuel consumption. That super-smart transmission saves some gas by ensuring you’re always in the right gear, but the XT4 has a second miserly trick up its sleeve: cylinder deactivation. That means when it’s running under light load the engine shuts off one or more cylinders until you need the extra power. And the benefit? Official numbers aren’t out yet, but Cadillac estimates 7.8 l/100km Highway and 9.4 l/100km City. We’ve saved the best for last — the interior is beautifully executed. Flowing lines, high-quality materials, and elegant styling combine to make this one of the most attractive cars you’ll ever sit in. The centerpiece is probably the 8” touchscreen, home to the Cadillac User Experience or CUE. In the XT4 this screen is also operated by a rotary controller in the center console. There are three trim levels here, but rather than “good, better, best” there’s what Cadillac calls a “Y” split. To explain: the base model is the “Luxury” trim. Upgrading from that means choosing between either Sport or Premium Luxury. Outside, the Sport is distinguished by a gloss black grille and window surrounds while the Premium Luxury gets bright metallic accents and satin window moldings. All trims ride on 18” alloy wheels, although there are different designs for each. And if you want to up-size, 20’s are available. Inside, Luxury and Sport trims have leatherette upholstery plus a quality audio system, a leather-wrapped three-spoke steering wheel and four USB ports. Sport and Premium add AWD, a power liftgate, and driver’s seat memory. If leather’s your thing, you’ll find that in the Premium Luxury XT4. As you can probably tell, we’re pretty excited about the XT4. 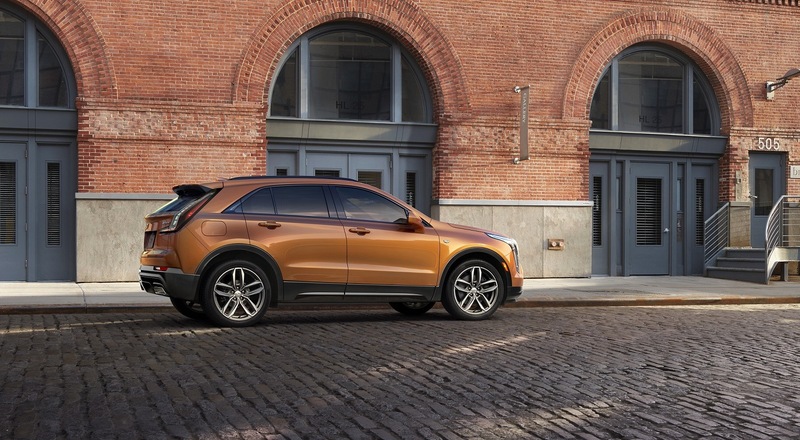 It’s something new for Cadillac: a compact SUV with all the style, power and luxury you’ll find in the bigger models. Sales start in time for the 2019 model year, so if you want one of the first off the line, call us to schedule a test drive.